Every Athenian alliance, every declaration of war, and every peace treaty was instituted by a decision of the assembly, where citizens voted after listening to speeches that presented varied and often opposing arguments about the best course of action. The fifteen preserved assembly speeches of the mid-fourth century BC thus provide an unparalleled body of evidence for the way that Athenians thought and felt about interstate relations: to understand this body of oratory is to understand how the Athenians of that period made decisions about war and peace. This book provides a comprehensive treatment of this subject. 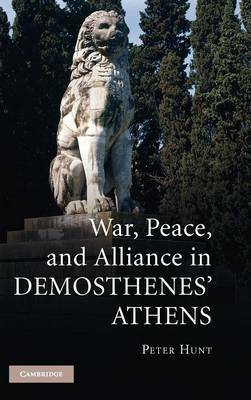 It deploys insights from a range of fields, from anthropology to international relations theory, in order not only to describe Athenian thinking, but also to explain it. Athenian thinking turns out to have been complex, sophisticated, and surprisingly familiar both in its virtues and its flaws. Peter Hunt is Associate Professor of Classics at the University of Colorado at Boulder. He has taught at Vassar and Davidson Colleges, the University of Colorado, and Harvard University, and his publications include articles in top academic journals and edited collections. His first book was Slaves, Warfare, and Ideology in the Greek Historians (Cambridge, 1998).